Step 1 Bring 500ml of water to the boil, add the quinoa and simmer for about 8-12 minutes until it has tripled in size and started to sprout little tails. Then rinse and set aside to cool. Step 2 Place the chicken strips in a bowl, add your olive oil, garlic and parsley, and toss to make sure the chicken is evenly coated. Step 3 Heat a grill pan until hot, then cook the chicken strips for 3-4 minutes on each side until golden. Set aside. Step 4 Make the Chimichurri dressing: pop everything into a food processor and blitz for 20 seconds just prior to serving. 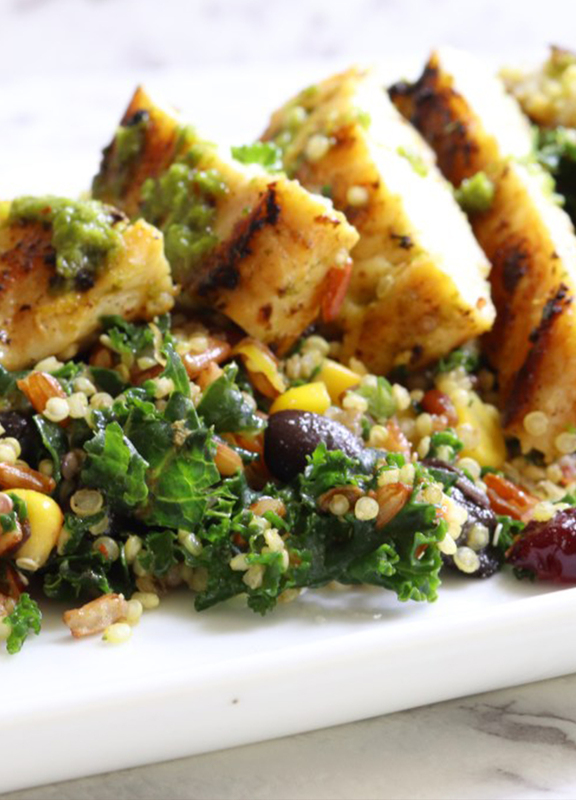 This protein packed chicken and quinoa salad is a great lunch idea, it is full of essential vitamins and minerals to get you through your day.